Foundation primers are a recent discovery for me and a makeup favorite of the moment. As you all know, I’m on a mission to discover new, natural, organic &amp; toxic free beauty &amp; personal care items. Luckily, Juice Beauty has become a very reliable brand when it comes to those qualities. For the longest time I steered away from foundation primers because I always felt like it was an unnecessary step, too many questionable ingredients and might make my skin look too “cakey“. After receiving a sample primer &amp; trying it out for some time, I realized the purpose of having a good primer under your makeup wasn’t so unnecessary after all. Primers smooths out your skin, improves texture and helps my makeup last longer with little to no touch ups. Although its not a step I do everyday, it is something I make sure I incorporate during those special events where I may wear more makeup than usual. Antioxidant-rich vegan makeup powered by an organic base of botanical juices, waxes &amp; powders infused with natural whole PHYTO-PIGMENTS™, age-defying serum and cold-pressed oils to deliver vibrant color, illuminate skin, smooth lines &amp; wrinkles and blur imperfections for a flawless complexion and naturally beautiful radiance. What it do? Smoothing &amp; Perfecting primer with illuminating qualities. Code word: Illuminating. Perfect for my moody &amp; dry skin. I’d always steer away from products that claim to be “illuminating” but looks like my skin has been on the perpetual dry side, so instead of leaving me greasy, this gives me just the right amount of “glow” or moisture without appearing too shiny or greasy by the end of the day. I apply this primer after I moisturize and before foundation or CC Cream. Considering I did purchase this during the winter, I’m curious about its performance during the summer months. We did experience some heat briefly recently and it seemed to have held up nicely. Since my skin is more on the dry side, any potential oiliness will be kept at bay for sure. I purchased mine at Ulta and also heard that Whole Foods also carries the Juice Beauty Line. After I moisturize my skin I prep with this primer. A little goes a long way as just one pump is able to cover my entire face. Since it is an Illuminating primer, If I use more than that I risk looking a bit greasy. My skin has been stuck on the dry side so this helps balance out any dryness. It goes under my It Cosmetic CC cream (shade Tan) and My L’oreal True Match foundation very nicely. The illuminating factor gives me a very subtle glow which I love especially when I notice I have any dry patches. It also does wonders for those no makeup days! If I’m having a lazy day or heading out to the Gym, but have errands afterwards, I just apply my moisturizer and this primer over it and out I go. It helps improve my skin’s texture, minimize redness and gives it a very nice glow. Now it doesn’t cover spots or darkness, but does help even out my skin tone and help it not look so dull without foundation. Pros Light weight, blends &amp; applies easily. Moisturizing. I was a bit skeptical to be honest about this purchase. I had the Smashbox primer full size version on hand after loving the sample I got, but I was also concerned about the silicones and nasty ingredients. It was as if the sales girl who recommended it to me was reading my mind because she so confidently pointed out all the nasty ingredients the other primer had vs. this one. I was skeptical at first because most “organic” “natural” based makeup products have been really bad. No pigment, watery, lacking consistency has been my issue with natural based cosmetics. 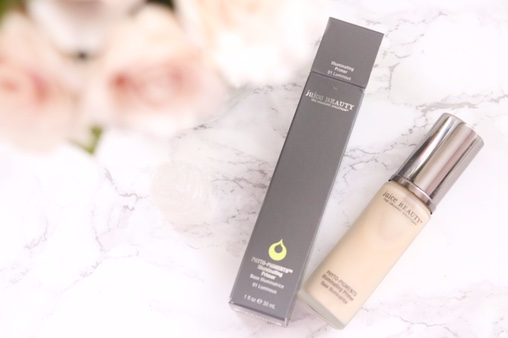 Juice Beauty however seems to be a step ahead as this primer delivers very well. Cons: I have no cons to point out abut this product honestly! It has no scent, the pump is efficient and I don’t waste any product. There’s a lot to love about this primer!